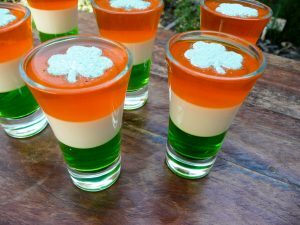 Irish Jello Shots are a great fun addition to any St Patricks Day Party. Into a jug place the Green Jello Powder and add the hot water. Stir until the jello has dissolved then add the Vodka or extra water and pour the jelly into your shot glasses. You want each layer to be about a third of the glass so try to pour an equal amount of the green jello into each glass. Once all the shot glasses have a layer of green place the glasses into the fridge for about an hour to set. When the green jelly has almost set you can start to make the creamy panna cotta layer. Into a saucepan pour the cram and add the sugar. Stir through and add the Baileys or Irish cream. Whilst stirring, bring the cream up to a simmer and then add the gelatine powder. Continue stirring and allow the cream to come back up to a simmer and the gelatine to dissolve. Remove from the heat and allow the cream to cool. I poured my cream mixture into a jug to cool. Once the cream is quite cool and the green layer has set completely gently pour the cream on top of the jelly. Again you want this layer to be about a third of the shot glass. Place the glasses back in the fridge to allow the cream to set. After about an hour the cream layer will be set so time to make the orange layer. Again place the jello powder in a jug and add the hot water. Give it a stir and then add the whiskey or water, stir again and carefully pour on top of the cream layer. Your shot glasses should be virtually full now. Place them back into the fridge one last time to completely set. This next part is optional but I like the finished result. Using paper or card to make a template, draw a shamrock in the centre and cut it out. 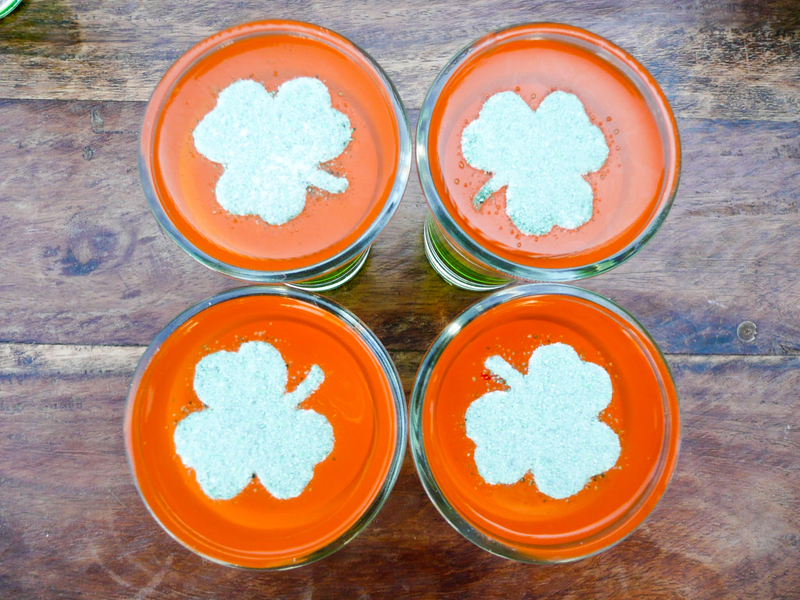 Place the paper on top of the shot glass and use a sieve to sprinkle cornflour in order to fill the cut out shamrock. Then sprinkle the green sugar on top of the cornflour and gently remove the template and you will have cute shamrocks on the top of your jello shots.